Grab a book and a pledge sheet to help raise funds for the SES PTSA. 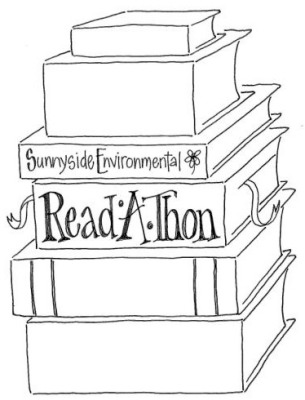 Sunnyside’s annual Read-A-Thon begins Tuesday, January 26 and runs through Monday, February 8. There are great prizes for the students who read the most units and the individuals and classes that raise the most money. Pledge sheets and reading logs, along with more information, will be coming home with students on January 26. The Read-A-Thon has become a primary means to raise money for the PTSA’s General Fund, which provides for additional teachers in the classrooms and special programs, and allows all students to participate in music and arts programs and marine biology trips. This year we are featuring some fun new events during the Read-A-Thon. There will be several days where students will have the choice to attend read-ins during school, as well as an after school read-in event on Friday, February 5. Grades K-2, 3-5 and 6-8 will participate against each other in a house cup contest to see which house earns the most reading units. Certain staff will be on the look-out around school during the two weeks of the Read-A-Thon searching for students to catch in the act of reading. If a student is caught reading, they will receive a stamp and be asked to pose for a “Got caught reading,” poster. Pictures will be taken daily during students’ lunch time. We will still have the cherished dress-as-your-favorite-character day on Friday, January 29. More information to come on these wonderful events in the flyer that will accompany this year’s pledge sheet. We look forward to a great couple of weeks when we can all curl up with a good book and at the same time raise money for the school’s exceptional programs. Please contact Heather Dury at heather.dury@gmail.com if you are available to help.